If you follow the jobs report issued by the Labor Department each month, you have probably heard of something called the “labor force participation rate.” This is the percentage of the population between the ages of 16-64 that are employed or unemployed but looking for work. Of course, there are many reasons that a person 16-64 may not be interested in working. Most notably, many people in that age bracket are in school. Also, retirement before 65 is becoming increasingly common. However, it also includes those referred to as “discouraged workers”. These are individuals who would like to go to work but were previously unable to find a job and have not actively sought employment for the previous twelve months. The labor force participation rate currently stands at just under 63%. This is about a 4% decline from a decade ago. Economic analysts and political pundits frequently point to this decline as evidence of slack in the economy and as a source of potential economic growth if more individuals could be coaxed back into the labor force. When analyzing the current state of labor force participation, it is important to consider recent rates in their historical context. The Labor Department first began tracking the participation rate in 1948. At that time the rate was 58%. The rate did not change much through the 1950s and the early 1960s. But in the late 1960s the rate began to track up and continued to do so until it hit an all-time high in February 2000 of 67.3%. This increase was mostly fueled by more women entering the workforce. 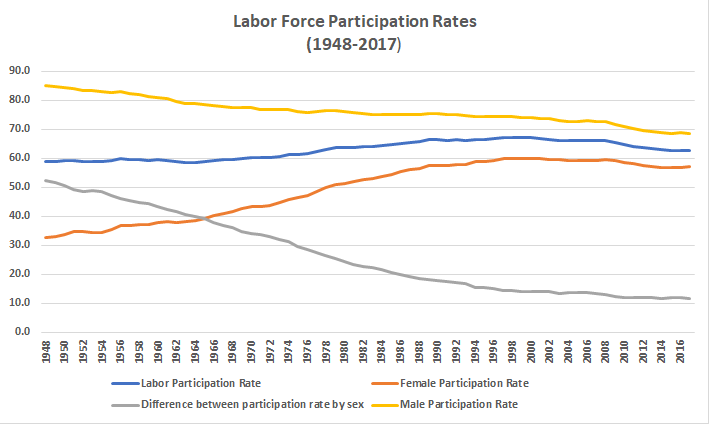 In 1948 the participation rate for women was only 33% while the rate for men was 85%. However, after 1948, the rate began to consistently rise for women and fall for men. At the high point in 2000, the rate for women and men was 60% and 74%, respectively. After 2000, the rates for both have drifted downward, but the rate for men has fallen somewhat more than women. In 2017 their respective rates stood at 57% and 69% and the overall rate was 62.8%. There has been little change in these rates for the last five years. So, while the participation rate has been in decline since 2000, the decline has been relatively moderate, and today’s rate is in line with longer term historical averages. Something the Labor Department does not track is the ratio of the total number of people employed in the US to its total population. But I was able to correlate these using data from the Labor Department and the Census back to 1938. The results were not at all what I expected. There is a bit of a glitch in this data because the Labor Department only tracks nonfarm employment. 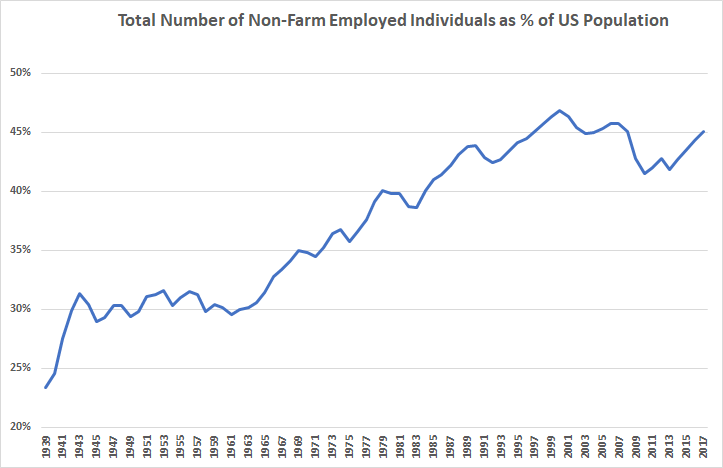 Obviously, there was a mass exodus from farms to industrial jobs in the first half of the 20th century, which accounts for much of the steep runup in the ratio from the 1930s through the 1950s. In the 1960s and 1970s we again see the effects of women entering the workforce. But what I find fascinating about this data set is that with 45% of the population currently holding down jobs, we are within2% of the all-time high in 2000. But the more general conclusion I draw is that while there may be some room for improvement around the margins, whether people want to work or not is driven by sweeping demographic and cultural trends, on which public policy is unlikely to have a dramatic effect. If we are relying on more people suddenly deciding they want to enter the workforce for our future economic growth, when we are already near all-time highs, I think we are likely to be disappointed.